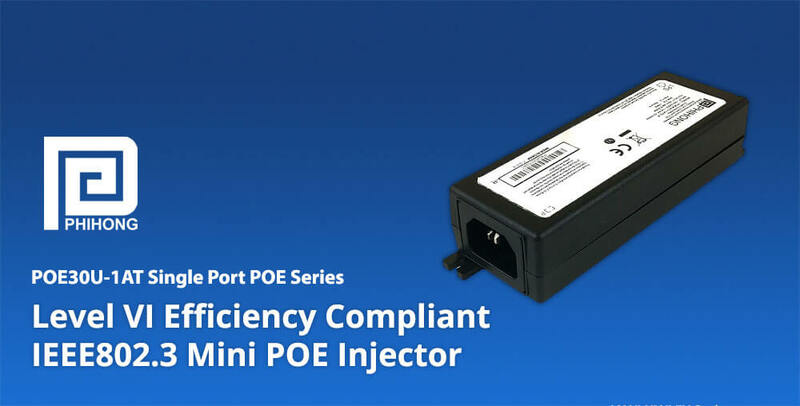 Phihong Introduces Industry's First US Department of Energy Level VI Efficiency Compliant IEEE802.3at Mini Power-Over-Ethernet Injector » Electronic Salesmasters Inc.
Phihong’s new 30 watt POEA30U-1AT single port Power Over Ethernet (POE) injector series are the first IEEE802.3at mid-spans on the market to meet the US Department of Energy’s (DOE VI) efficiency regulations for external power supplies. Download the datasheet for Phihong’s 30W DOE Level VI POEA30U-1AT injectors here. We are honored to serve as a manufacturer’s rep for Phihong USA, a global leader in power adapters, battery chargers, power supplies, LED drivers, lighting controls, and Power over Ethernet products.